Mom, the Intern: 33.3% of a year and the S.W.A.T. team. 33.3% of a year and the S.W.A.T. team. That's how old Smush turned on Saturday. Oh yes. He is four months old. Oh my, he is huge. 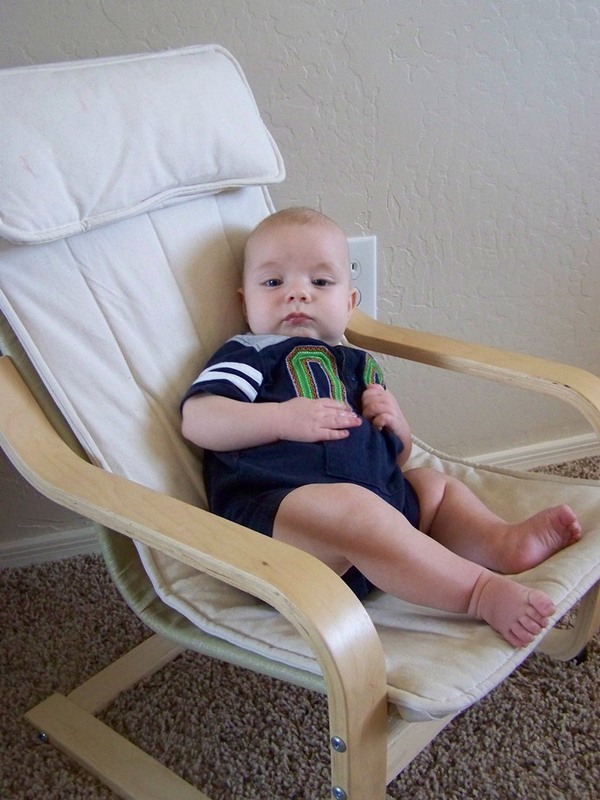 On Sunday, a new friend of mine from my church congregation thought he was eight months old. Understandable. Sometimes, I think he's eight months old, too. Why yes, I did whip out my camera and take a whole bunch of pictures of the event (I'm a journalist!). 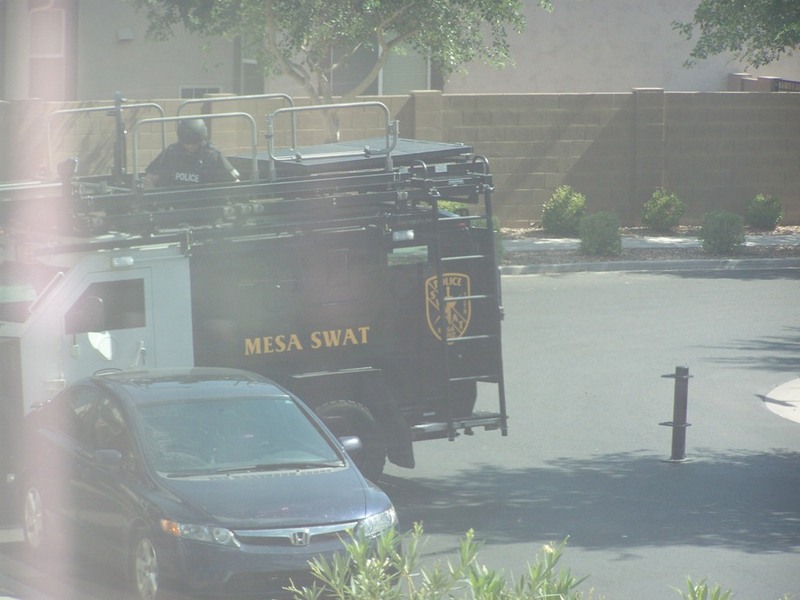 And why yes, that is a battering ram behind the SWAT vehicle. Did they end up using it? Were shots fired? Did anyone get taken to the pokey? Find out when I write my next entry! I wanna know!!! I like to know what's going on in my neighborhood, but I live next to a TOTAL Gladys Kravitz. She repeatedly rang our bell the other morning because the screen was off our window. I already knew because I was the one who did it! So there is no point to my random story, but I want you to finish your EXCELLENT story! Oh you're such a tease Jenna! I don't know whether to say "Cool!" or "How scary!" Since I grew up in NYC and my bro was on the SWAT team I'm gravitating more towards COOL, though living in podunk OK has slowly made me more boring, so I do think it is just a bit unsettling... Glad you're safe! 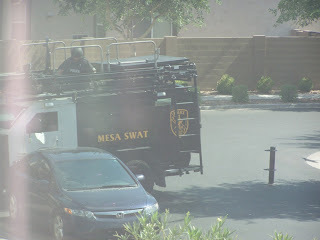 I see you're in Mesa (I guess I didn't know exactly where in AZ you were... why in the world did I think Flagstaff?!?!) which only adds to your coolness because I love that city! I've only been there once (for a wedding: Bea-u-ti-ful temple!!!) but fell in love. Especially with that awesome pizza joint with the humongo organ!!! PS> I want to gobble up The Smush... those thighs!!! You make beautiful babies! Your litte man is as big as my 10 1/2 month old little man. I can't believe how big your kids are getting. Bubs is so grown up! Can't wait to hear your swat story. Tell Dill that I said hi.